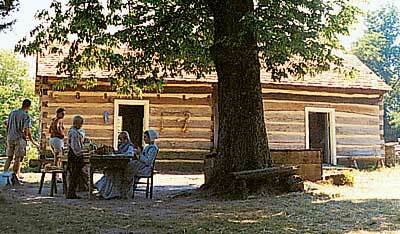 Home (All Topics) → Travel → USA → Lincoln Log Cabin State Historic Site, Illinois: 16 People Once Lived Here! Anyone interested in Abraham Lincoln would enjoy a stop at the Lincoln Log Cabin State Historic Site in east-central Illinois. The 86-acre site includes a replica of the two-room cabin where Lincoln's father, Thomas, and his stepmother, Sarah Bush Lincoln, lived from 1840 until their deaths in 1851 and 1869, respectively. It was pretty hard to believe that at one point, 16 people lived in the tiny cabin! A living-history farm surrounds the cabin, and we had fun exploring the log barn, gardens, smokehouse and other buildings while re-enactors in period garb did their chores. The site is open from 9 a.m. to 5 p.m. Wednesday through Sunday from April through October; closes 1 hour earlier the rest of the year. Living-history programs only run from May through October. The park is located on Lerna Road, roughly 17 miles southeast of I-57 and 20 miles southeast of Mattoon. From I-57, take Exit 190 and follow State Highway 16 east for about a block, then head south on Lerna Road and follow the signs.